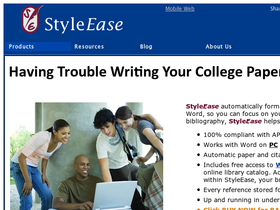 StyleEase Software, online at styleease.com makes writing easier for College students. If you need a software to help you write academic papers in APA, MLA, Chicago/Turabian, or Seminary style, look no further. StyleEase continually offers the best products on the market since 1991. StyleEase works within Microsoft Word to automate your paper and citation formatting, making it easy for you to focus on the content of your paper, thesis, or dissertation. 58coupons will help you save with StyleEase promotions, coupon codes and discounts. Enjoy free, automatic product updates for life when you buy the StyleEase software. Visit styleease.com today. Instantly download the StyleEase software today and pay only $35. Follow this link to begin. Buy the StyleEase software today for only $40. Click link to get started. Get the best of both world with instant download and CD back up of the StyleEase software yours for only $45. Click link to order yours today.